My friend Kim gave me four hens, a rooster and a super cute, little white goat named MeMe. You may or may not remember my goat owning dreams. 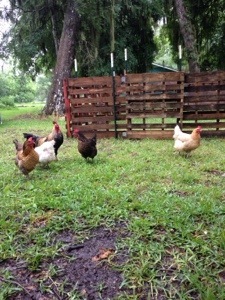 We picked up the chickens from her last weekend and they quickly made themselves at home, laying eggs and everything. MeMe however was put on hold due to being busy, weather and quite frankly my concern she wouldn’t stay in our little pallet pen. Today was the day, despite an afternoon shower, we loaded her up and brought her home. Once she was settled in, I was feeling like a real live farmer. I mean with a goat, 24 chickens and two turkeys it really felt official! On that high, we began walking the property and planning where we would put a new, permanent pasture for her. I began to hear some sounds that didn’t seem right, like some sort of raucous was going on. Aaron and I investigated and found our poor neighbor/renter, with a bum knee, chasing her dog around the yard, hot on the trail of my blessed free ranging chickens. We of course ran over to help her catch the dog, but as the hens all found hiding places the poor rooster became the dog’s target. That handsome fella ran straight for the pond and dove in, dog right behind him. Just last week I pondered over whether or not chickens could swim, after having a dream the yard flooded and they were swimming around. Today I saw, for sure, chickens CAN swim. So imagine the rooster swimming across the pond, the dog swimming hot on his tail feathers. I say ” I’m going in!” Then my dear husband, always the hero says “no you’re not, I am!” He climbs in, grabs the rooster, chunks him to safety on the shore and starts after the dog. Aaron trips on a log and ends up neck deep, phone and wallet still in his pocket (his phone survived!). The dog gets away and runs for it again but not for long because she gets distracted by all of the cute little teenager chicks in a cage. Once distracted she was easy to grab and leash up. After that excitement (good thing all the girls had laid their eggs already) MeMe stayed in her pen a few more hours until she got bored and climbed out. I mean I can’t blame her, I wouldn’t want to go from a nice big backyard to a small little pen with nothing but two turkeys to play with either. She escaped one more time and then we realized she was going to have to go back to Kim’s house until we get her pasture built, I guess we’ll be doing that instead of putting up the pool next weekend. Even though I gained and lost a goat all on one day, I still feel like the real deal, I mean a crazy day like that means you’re a farmer, right?